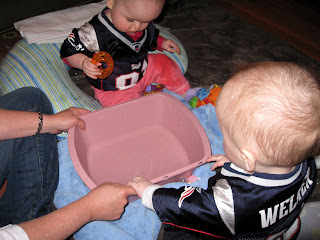 Our friends over at Sotoriffic Twins posted on toys that don't make noise, and one of the suggestions was Water Bucket with floating toys. Boston Mom thought that was a great idea. So, we got a bucket and floated some toys and put it on a towel in the living room! Well, the toys didn't last long, they were discarded and the REAL fun began... splashing!